This is just one of many of the deeply poignant lines from Stanford students’ performance of “The Every 28 Hours Plays: A Staged Reading,” an event which featured a series of poetic, haunting narratives intended to raise awareness on the Black Lives Matter movement. These vignettes covered a variety of different social issues, ranging from police-victim interactions to intimate familial strife brought on as a result of police brutality in the United States. The 22-person cast welcomed a sizable audience free of charge into Pigott Theater after its only rehearsal the day before. The two-hour production was a collaborative effort organized by members of Stanford Arts Institute, the Institute for Diversity in the Arts, Stanford NAACP, the Black Student Union, the Black Feminist Collective and the Black Men’s Forum. Each one-minute scene provided a raw, organic glimpse across an enormous scope of lives impacted by racism and police brutality through jarring discourse between cops, victims, members of victims’ families and everyday people. A mixture of single-character monologues, duo performances and small group performances highlighted interactions between members of the police force and individuals identifying as transgender, Black, Hispanic and more. In all, the vignettes served to humanize the African-American body, forcing the audience to question the true meaning of diversity and equality in America. His sobs grew harder to stifle, but the names of slain black Americans kept coming. Performing also allowed Cameron to outlet his emotions about being a minority for the first time in college, emotions that had accumulated over the past four years. For both viewers and actors alike, it was a gripping night, with intimacy juxtaposed with unease, laughter mixed with disquiet, simplicity and convolution. More than anything, though, it was a transformative evening of reframing perspective. More personal connections surfaced in the moderated post-show discussion, which allowed audience and cast members to reflect upon the plays. Cast member Adorie Howard ‘17 questioned why it takes a play to generate compassion towards victims of violence. “I’m really, really tired and I’m 21 years old,” Howard said. About its relevance to Stanford specifically, one of the co-producers Trevor Caldwell said before the performance that he hoped students could think outside of the Stanford bubble by listening to the narratives about police violence that may not manifest on daily campus life. Fellow audience member Dane Stocks ‘20 agreed, citing that the experience of viewing the play encouraged him to be a more active supporter for social justice in the United States. 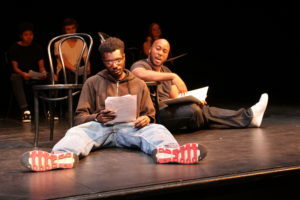 At the end of the production, the entire cast gathered on the small stage, and, in a scene resembling a vigil, Cameron read aloud the names of people who lost their lives as victims of police brutality. As the last name was spoken, the room stood still as both the cast and audience came together for a collective moment of silence for those individuals. Eventually, the silence broke way to thunderous applause that charged the small theater with the emotional gravity of the moments that had just been shared on stage. As producer Rebecca Struch appeared on stage to open up the floor for anyone who wanted to share a word about their experience, words like “mourning,” “solidarity” and “painful” fell from audience members’ mouths. Contact Courtney Gao at cgao20 ‘at’ stanford.edu and Claire Wang at clwang32 ‘at’ stanford.edu.